This "Eisbecher" is the big brother to the DDC version. The pump is mounted with a mounting ring which holds the pump with eight screws. Four LEDs, which are plugged into the pump socket, illuminate this plexiglass version. The lighting module enables illumination from above. Small rising pipes and Bubble Down also do their work perfectly here. The pump can be mounted either on the bracket or the included stands. In case there is space in the 3.5" hard drive cages in the case, the pump socket also comes with the appropriate screw threads (requires pump decoupling with M4 internal and external threads - Art. 52007). Gibt es für den Eisbecher eigentlich einen optionalen Deckel mit mehr als nur einem Anschluss, ähnlich dem Cape Coolplex? Wenn nicht, ist solch einer in Planung? 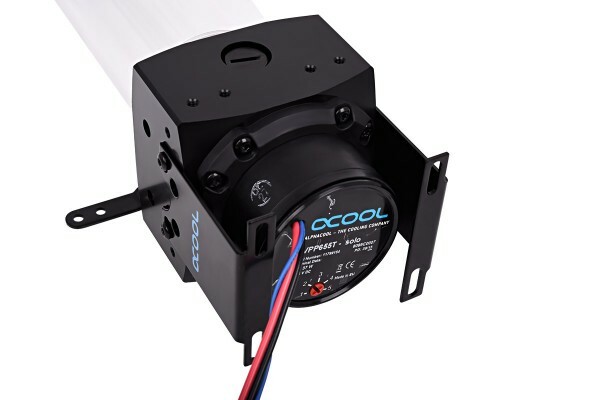 Aktuell nicht und was Alphacool für die Zukunft plant, wissen wir nicht.